"Buttery Greek crescent shaped cookie." Sift flour with baking powder. Set aside. Cream butter and gradually add sugar and beat until fluffy. Add egg yolk, brandy and vanilla. Beat again until very light. Stir in almonds. Blend in flour mixture, mix to form a soft, smooth dough. Chill 30 minutes or until it can be handled easily. Shape level tablespoonfuls of dough into crescent-shapes. Place 1 inch apart on ungreased cookie sheet. Insert whole clove into center of each. Bake for 25-30 minutes or until light...do not brown. Cool on rack. Dust generously with confectioners' sugar. Great recipe. 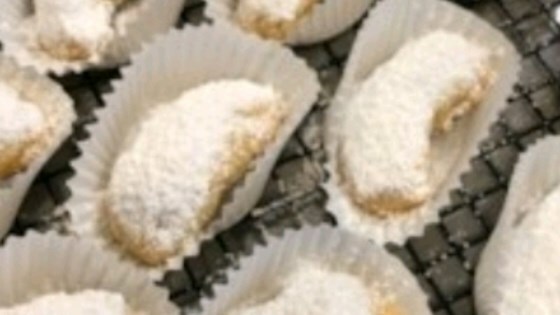 Made 24 Kourabiedes with this recipe. Excellent recipe. Exactly like my MIL makes!